InSinkErator, part of the Emerson Group, is celebrating 80 years of activity. The company, which launched cutting-edge products such as the domestic garbage disposal and the 4N1 Touch tap, has its origin in an innovation created in 1927. In that year John Hammes, architect of Racine (Wisconsin), realized a system to grind the food waste in order to eliminate it with the sink wastewater. 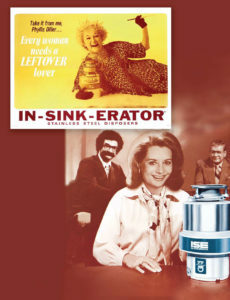 A little more than a decade later, InSinkErator was born, a wordplay between incinerator and sink. The success was such that the Emerson Electric Group acquired the brand and today InSinkErator is present in over 80 countries worldwide. On the occasion of the celebrations for this important anniversary, InSinkErator proposes a collection of infographics and images that illustrate how the garbage disposal has evolved over the years and its many advantages. “We are 80 years old but we feel young – says Ashley Munden, Managing Director Europe and Russia of InSinkErator -. We have seen the world change, change people’s habits, but our goal has remained the same: to create products that simplify people’s lives by protecting the environment and avoiding useless waste”.